One of the commonly asked questions when we move to the bigger and powerful 16-bit microcontroller is do we really need it? As the 8-bit microcontroller is already suite almost all of our needs from a simple blinking LED to more sophisticated embedded application such as robotics. 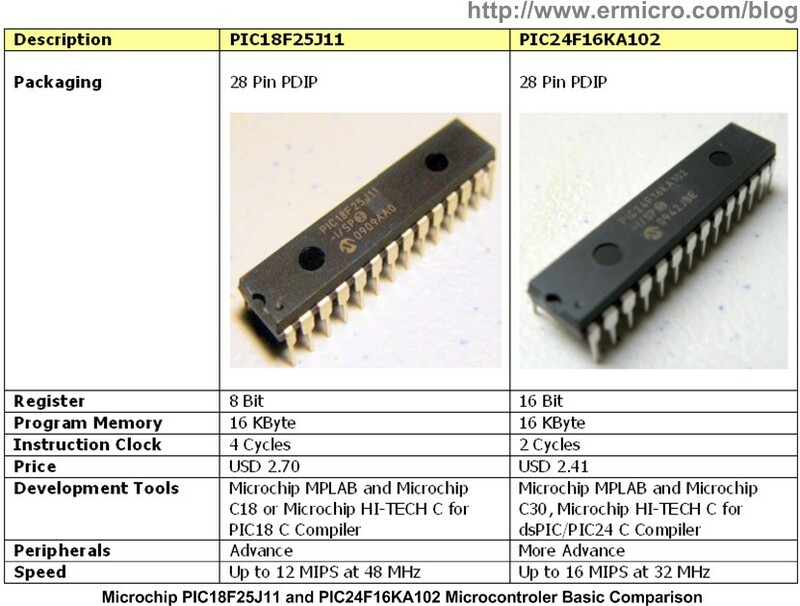 Despite the debate whether to use the 8-Bit or 16-Bit microcontroller or perhaps just go straight to 32-bit microcontroller in our embedded system design, first I will show you the Microchip PIC18F25J11 (8-Bit) and PIC24F16KA102 (16-bit) basic comparison. 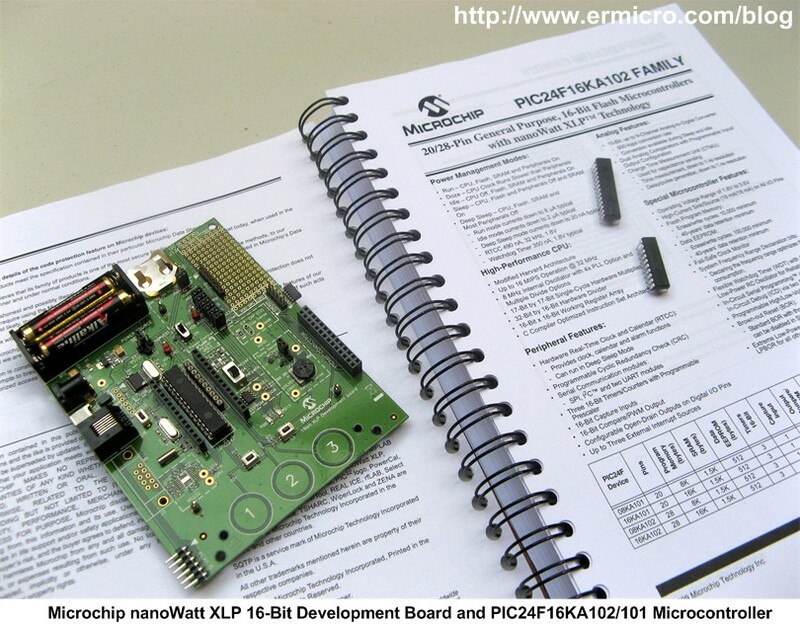 I use the Microchip PIC18F25J11 for the comparison as this microcontroller is considered as the 8-Bit highest end class microcontroller equipped with Microchip nanoWatt XLP technology while the Microchip PIC24F16KA102 is considered as the 16-bit entry level class microcontroller also equipped with Microchip nanoWatt XLP technology. Both microcontrollers have a build in hardware RTCC (Real Time Clock and Calendar), I2C, SPI and CTMU (Charge Time Measurement Unit) for capacitance sensing. Now here my opinion from the electronics hobbyist perspective, things that we always consider when learning a new microcontroller are how easy to quick prototyping it on the breadboard, how much the cost and the last is the development tools to be used. From the basic comparison above you’ve noticed that for the learning purpose these two types of microcontroller are almost identical. 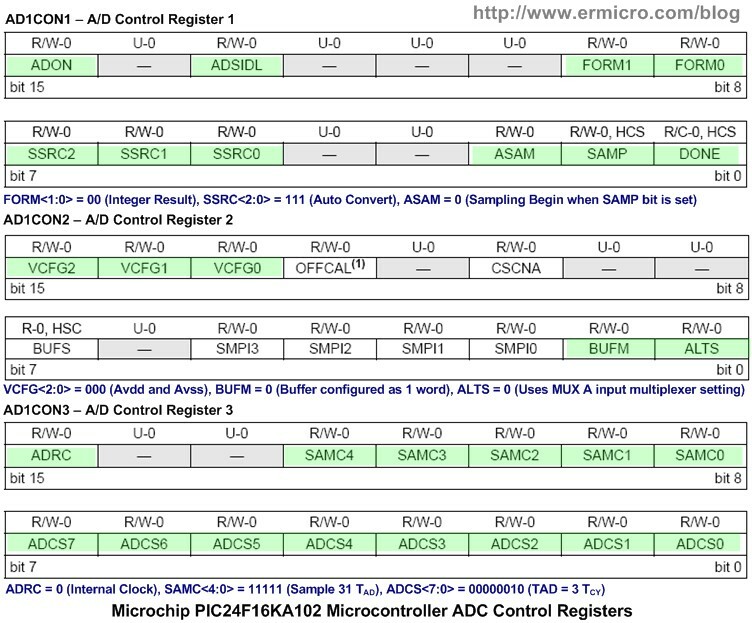 On the other hand let’s consider the advantages of learning the 16-bit microcontroller; the PIC24F16KA102 microcontroller families share the same architecture as the well known Microchip dsPIC (digital signal controlling) microcontroller families, therefore by learning the 16-bit PIC24F16KA102 microcontroller family will open your knowledge and richer your experiences to more advance application of the embedded world system and surely you will love and enjoy it. But for showing the basic PIC24F16KA102 microcontroller peripheral features in this tutorial, we could easily prototype it on the breadboard. 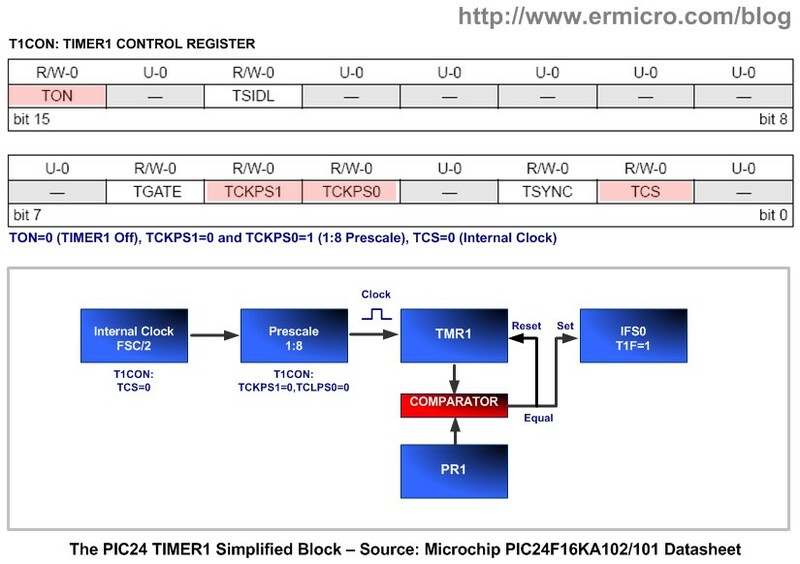 With 16-bit CPU internal data path, the PIC24 family microcontroller is being referred as the 16-bit class microcontroller. This means this microcontroller could process the 16-bit or 8-bit data with just a single instruction. 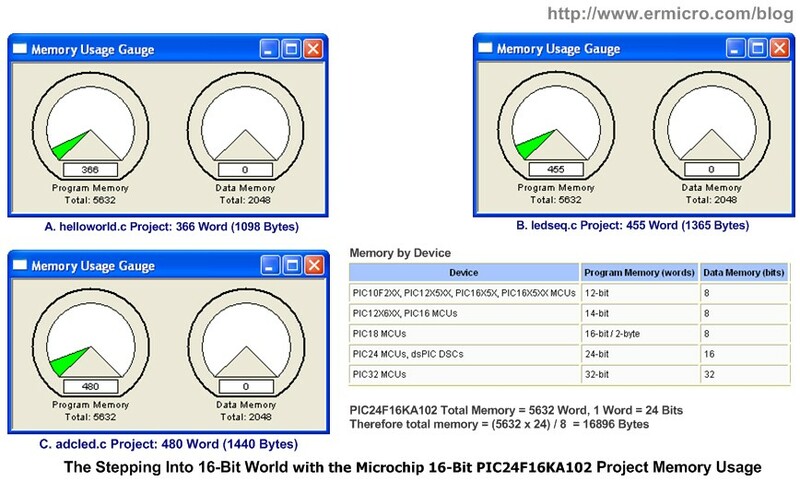 As the result compared to the 8-bit class microcontroller the 16-bit class microcontroller will perform better for intensive arithmetic calculation application such as GUI (graphics user interface) display, TCP/IP application, USB embedded host and digital signal controlling (dsPIC microcontroller family). Unlike the Microchip 8-bit (PIC12, PIC16 and PIC18) families microcontroller, the Microchip 16-bit PIC24 microcontroller families has a linear memory addressing design, therefore we don’t have to switch back and forth between memory “BANK” to access different peripheral registers as we do in the Microchip 8-bit families microcontroller; you could read more about programming the Microchip 8-bit microcontroller on my previous posted blog Introduction to Microchip PIC Assembler Language – Part 1. 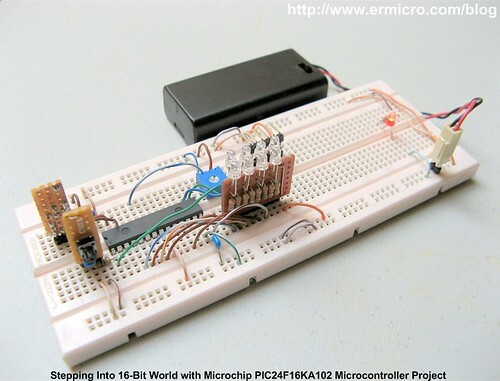 The 16-bit Microchip PIC microcontroller also has 16 x 16-bit array working register known as W0 through W15 compared to only one working register in Microchip PIC 8-bit (WREG), this make the programming code is more efficient comparing to the PIC 8-bit microcontroller because all the arithmetic operation should go through the working register in order to be processed. The Microchip PIC24 microcontroller class also only use 2 cycles clock per instruction compared to 4 cycles clock per instruction on the PIC12/16/18 microcontroller class; this make the PIC24 at least twice more faster than PIC12/16/18 microcontroller. 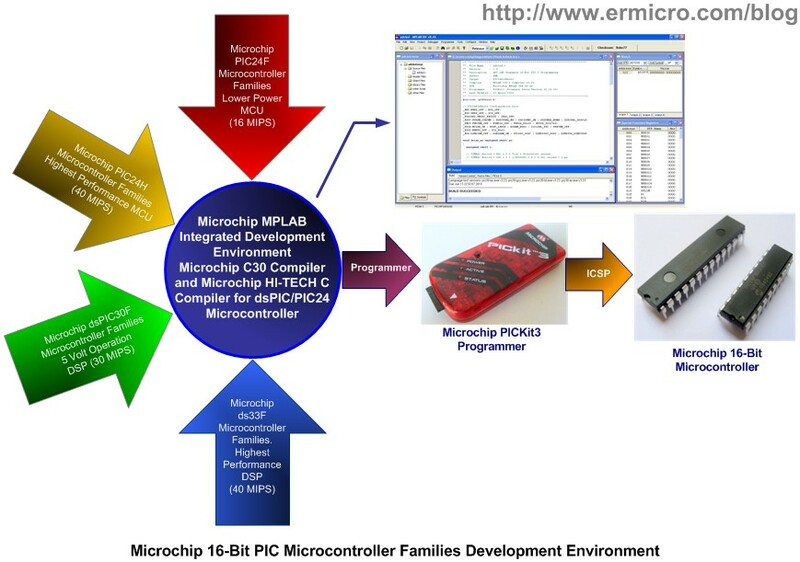 And the best of all, we still use the same Microchip powerful MPLAB integrated development environment for debugging, compiling and programming this 16-bit class microcontroller. 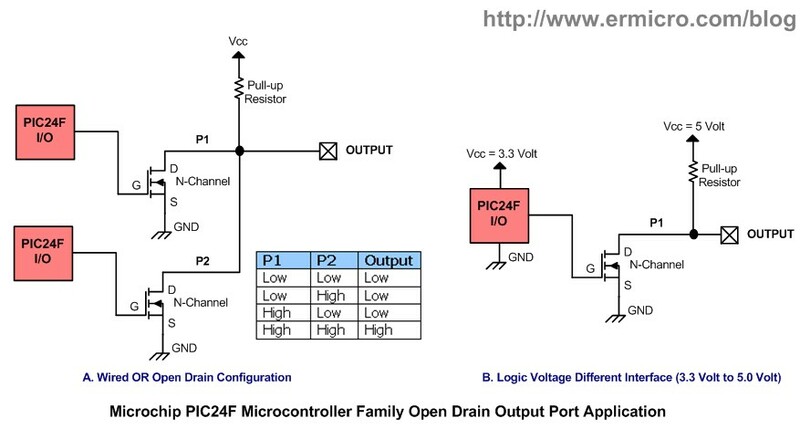 One of the advantages using the PIC2F16KA102 microcontroller is each of the output ports could be configured as the open drain output using the Open Drain Control Register (e.g. ODCB). By setting this 16-bit register to logical “1” we could configure the port as the open drain output where the P-channel MOSFET transistor is disconnect from the microcontroller output port and leave the N-Channel MOSFET transistor with the open drain (not connected to Vcc). In order for the open drain output to work you need to supply the Pull-up resistor to power the N-Channel MOSFET transistor. Remember when you configure as the open drain output, the output port only could sink current through the N-Channel MOSFET transistor. By setting the TRISB register bits (TRISB1 to TRISB15) to logical “1” we define the port as input (you could see it as “I” for input) and by setting it to logical “0” we define the port as output (you could see it as “O” for output), therefore by setting the TRISB register bits to 0xFF00, mean we set the RB0 to RB7 as output ports while the RB8 to RB15 as the input ports. Next we configure the ADC (analog to digital conversion) pin configuration register AD1PCFG bits to logical “0“, this mean we configure all of the 10 ADC channel port available in PIC24F16KA102 microcontroller as the digital I/O port. By setting the ODCB register bits to logical “0” we disable the output port open drain feature which we need it in this project to drive the display LED. The last is we simply set the PORTB latch register (LATB) to reset all the display LED. Writing to the PORTB latch register (LATB) will give the same result as we write directly to the PORTB register. 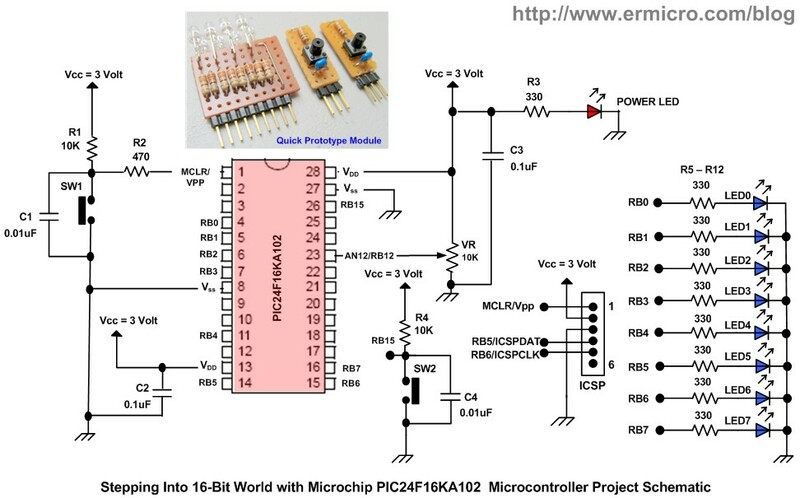 The Microchip PIC24F16KA102 microcontroller have build in three independent 16-bit TIMER (TIMER1, TIMER2 and TIMER3) where TIMER2 and TIMER3 could be configured as a single 32-bit TIMER. On this tutorial we will use the 16-bit TIMER1 as our delay routine base. As implied by its name, you could look the TIMER1 as an ordinary 16-bit counter named TMR1; where you could use the external or internal clock to pulse this counter controlled by the TIMER1 control register (T1CON). As the counter value is incremented by the pulse, the 16-bit counter output is constantly compared to the PR1 register when TMR1 reach the PR1 value than the the TIMER1 will automatically set the TIMER1 interrupt flag (T1IF) bit on Intterupt Flag Status 0 register (IFS0). To enable or disable the weak pull-up resistor we could set the CNxPUE corresponding bits to either “1” (enable) or “0” (disable) in the PIC24F16KA102 microcontroller pull-up control register CNPU1 or CNPU2. In this tutorial because we use the external pull-up resistor, therefore we disable this feature. Differ from the 8-bit PIC12/16/18 microcontroller families, the 16-bit PIC24 microcontroller ADC peripheral support many advance features such as two independent multiplexing analog channels, multiple single channel A/D conversion or multiple multi channel A/D conversion for single interrupt, four type of A/D conversion data format result (integer, signed integer, fractional and signed fractional) and multiple trigger A/D data conversion method. The PIC24 families A/D conversion required one A/D clock cycle (TAD) plus 2 additional clock cycles, thus the PIC24 SAR need at least 12 TAD cycles to do the 10-bit conversion. For correct A/D conversions, the A/D conversion clock (TAD) must be selected to ensure a minimum TAD time of 75 ns. Finally when the conversion is done, the result is loaded into the sixteen words of A/D result buffer array registers (ADC1BUF0 to ADC1BUFF). On this tutorial I used one channel (AN12) with manual sample start A/D conversion method. 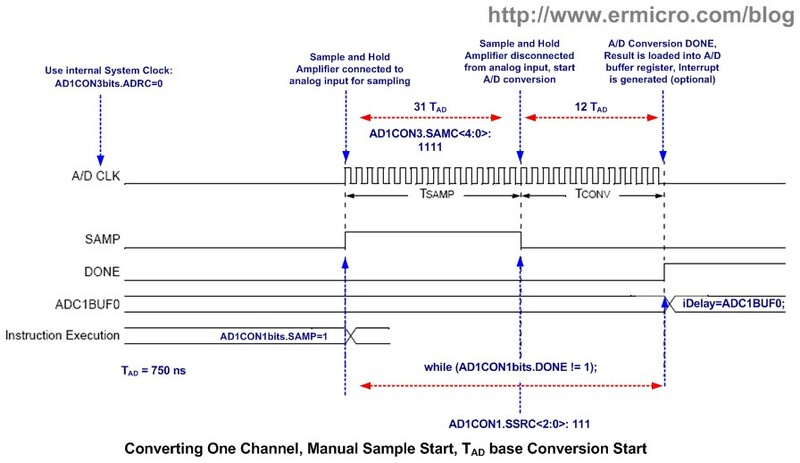 Because in this tutorial I used automatic A/D conversion after the sample and hold amplifier captured the analog signal input, therefore we have to set the A/D conversion source trigger bits (SSRC<2:0>) on AD1CON1 register to “111” to use internal counter for automatic conversion after sampling and set the ASAM bits to logical “0” to instruct the sample and hold amplifier to begin the sampling when the SAMP bit on register AD1CON1 is set to logical “1“. 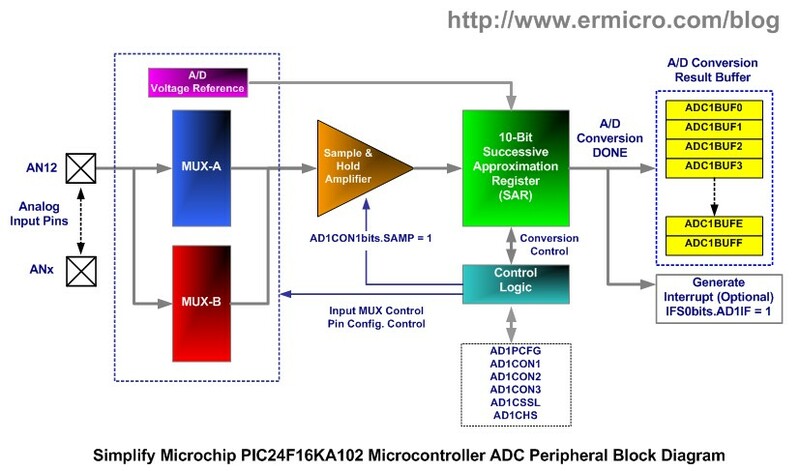 After starting the sample and hold amplifier for sampling the analog input, the ADC peripheral will automatically do the conversion after 31 TAD and by examining the DONE bit on the AD1CON register we could get the A/D conversion status and later read the A/D conversion result on the ADC1BUF0 register. This A/D conversion result than will be used as the delay parameter for displaying the LED, therefore by adjusting the 10K trimport we could adjust the LED display speed. As you walk through this 16-bit microcontroller world tutorial you will noticed that although the inside architecture between the 8-bit (Harvard) and 16-bit (Modified Harvard) Microchip PIC microcontroller is different, but they shared the same designed pattern such as the peripheral register name, the pins name and they all use the Microchip MPLAB integrated development environment. 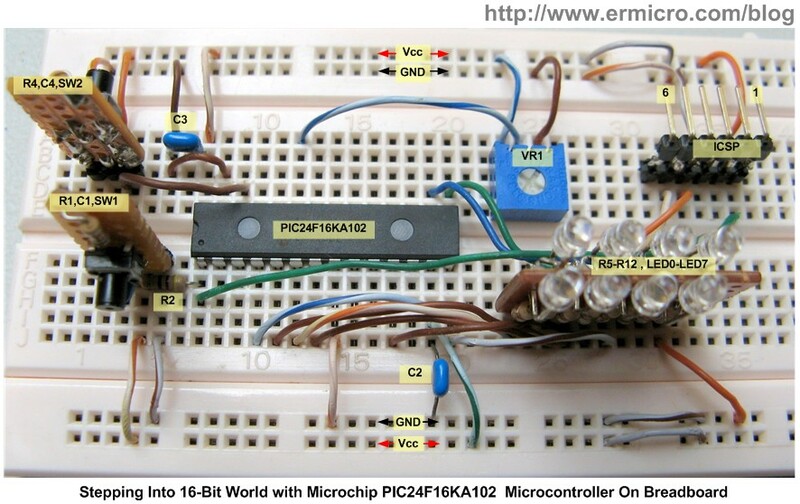 This make move from the 8-bit to the 16-bit class microcontroller become straightforward and easy. By using the 16-bit class microcontroller, you could bring broader range of application into the embedded world. Make sure you correctly install the latest MPLAB IDE and you have a similar hardware circuit as shown on the project.